Nothing better than the Sunsets at Sanibel Harbour rental’s spectacular Gulf & beach views on this 2nd floor unit. This spacious 2 bedroom / 2 bathroom waterfront Sanibel Harbour condo with a Gulf View is newly renovated as of fall 2014. 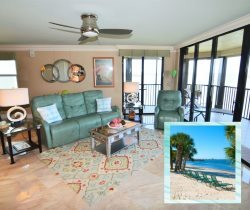 Enjoy hearing the surf come ashore from your balcony or the nicely appointed living room. The tropical color scheme and hints of the beach throughout the unit brings the outdoors inside. This unit offers a King bed in the master bedroom and two Twin beds in the guest bedroom along with a sleeper sofa in the living room. You may have found this rental on HomeAway 4363855, HA ID 4363855, VRBO 4363855 or Vacation Rentals 4363855. Our stay was absolutely wonderful! We are a family of 5, with 3 young children. Our condo had everything we needed and the location was awesome!!!! Very clean, comfortable beds, and loved the huge sliding glass door and view. We would definitely return. The only interaction was to print boarding passes prior to departure, and the staff was extremely helpful! We loved the property! Great location close to both Sanibel Island and Ft Myer beach, while also having a private beach and condo pool! We planned on utilizing the Marriott resort for the pool, but once we saw the condo pool and beach there was no need to. The convenience of the restaurants at the Marriott resort were nice. Overall, a great condo with a beautiful view! We will definitely be back again!